Melissa and Justin celebrated their intimate elopement wedding with around 20 of their family and friends at Creativo Loft in Chicago. This was a fun summer casual wedding, and we loved the bride’s halter style short dress, and the groom’s cool beige jacket-less suit. Their wedding rings were both enchanting with the bride’s emerald stone and the groom’s custom engraved design. With a champagne toast and time to mingle with guests, this is a fun and easy way to celebrate a marriage. 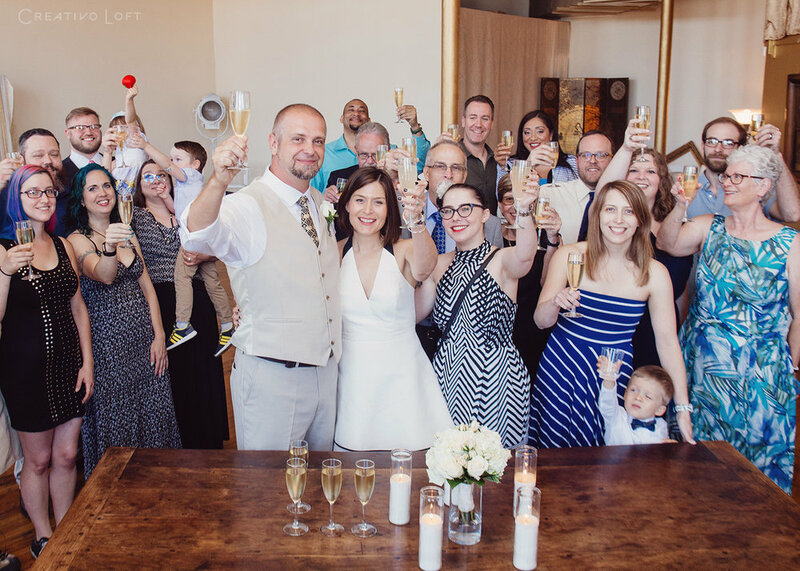 They selected our special Group Elopement package, which is a two-hour ceremony and celebration at Creativo Loft, and may be customized with a la carte add-ons. They included additional time with photographer Giorgio. Before their ceremony, Giorgio met the couple at their hotel and took some portraits there before going to a nearby stone and ivy garden courtyard on Michigan Ave. for outside wedding portraits. Creativo Loft is located adjacent to downtown Chicago, less than 2 miles from Michigan Ave., so any great portrait location in the downtown area or along Lake Michigan is easy to get to within 5 to 15 minutes from our venue. Couples that choose this package also sometimes have us order light appetizers and/or plan to go to a restaurant afterwards. In addition to the usual package upgrades, we can also help couples find and book restaurants and coordinate their after-elopement plans. Please contact venue director Sarah for more information if you are interested in having a similar wedding celebration.